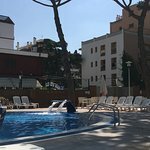 After checking several prices we Booked the Mar Blau hotel 18th September for four nights half board direct on their website which was really easy and cheap. On arriving at the hotel the friendly receptionist explained where our room was and all the amenities that were on offer. We were given a room on the 6 floor facing the road which was no problem as we had asked for a high room. The room was adequate for our short stay, double bed, wardrobe, bedside tables, chair and free fridge with two bottles of water supplied. The fridge may have a charge at peak times. The bathroom was clean and of a good size. Out on the balcony was a table and two chairs also there was some pegs and a line which helped with wet costumes. My only concern on the balcony is that the area you stand on the metal frame has a two inch gap round the bottom and sides this may have caused a problem with small children. The rooms are cleaned every day, beds made and towels changed if you require new ones. We booked half board the breakfast was 7-45 till 9-45 and there was ample to eat. Fried eggs and pancakes cooked fresh every morning. Fruit, meats several different breads and pastries. Tea, coffee and fruit juices. 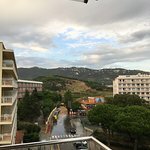 We had evening meal but we were told we could have changed this to lunch if we...After checking several prices we Booked the Mar Blau hotel 18th September for four nights half board direct on their website which was really easy and cheap. On arriving at the hotel the friendly receptionist explained where our room was and all the amenities that were on offer. We were given a room on the 6 floor facing the road which was no problem as we had asked for a high room. The room was adequate for our short stay, double bed, wardrobe, bedside tables, chair and free fridge with two bottles of water supplied. The fridge may have a charge at peak times. The bathroom was clean and of a good size. Out on the balcony was a table and two chairs also there was some pegs and a line which helped with wet costumes. My only concern on the balcony is that the area you stand on the metal frame has a two inch gap round the bottom and sides this may have caused a problem with small children. The rooms are cleaned every day, beds made and towels changed if you require new ones. 7-45 till 9-45 and there was ample to eat. Fried eggs and pancakes cooked fresh every morning. Fruit, meats several different breads and pastries. Tea, coffee and fruit juices. We had evening meal but we were told we could have changed this to lunch if we gave them notice. There is a gentleman greeting you who does look a bit stern and will turn you away if you haven’t got your card with your lunch details on but he is only doing is job. Again ample to eat. Fruit, soup, fish, hot meats, salads, chips, pasta and several other things. There was lovely little cakes for desert. We ordered bar food on last day burger, few French fries, large beer and small beer for 17 euros this seemed expensive. The swimming pool is a nice size. The one area where the water runs off what looks like a dolphins tail is quite deep. There is another little pool for small children. Round the swimming pool there are lots of sun beds. On the fifth floor there is a solarium area for over 18. This area has sun beds that are padded and a jacuzzi in the centre. This was a very relaxing area and a great sun trap. We didn’t find the area around hotel noisy but a lot of the places looked like they had closed for the season. There is a nice little bar down the road, first left didn’t get the name but a friendly bar lady serving. There are several small supermarkets close by. 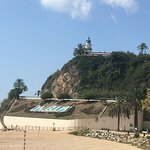 The beach of Calella can be found over the main busy road and then about another 150 metres down the road. A railway line runs across the beach front and access to the beach can be got to by underpasses. The beach isnt sand but small tiny stones which we found better as they didn’t stick to you like sand does. The beach is very long and very clean. It has a bike zone all along the promenade. As you walk into the sea the depth increases rapidly so children would have to be supervised all the time whether this is the same along the beach. There are several lovely clothes shops and lots of souvenir shops in Calella. A large market is at one end of the town on a Wednesday with lots of cheap items to buy. We had a 10 day stay in this hotel on full board. While the hotel was generally pleasant, clean and well kept, our stay was stained by the rudeness of restaurant's head waiter. The food and variety of it were good, it was well prepared and the staff in the restaurant apart from the maître d', Mr. Juan Benitez was polite and attentive. They were clearing the table while we were still eating, which we found odd, but it was not their fault. On the other hand, the man who supposed to represent the restaurant before the guests was so unpolite and rude that we were stunned. First, he didn't greet a single guest but silently crossed out their meal card when entering the restaurant. Than he snooped around the restaurant looking more like he was spying on the guests than running it, lurking from behind the pillars. Once the guest who was at the dinner for the first time, not knowing that beverages were not included in the meal took a bottle of water from the trolley. Mr. Benitez grabbed it from his hand like the guest was trying to steal it without any mannerly explanation that drinks are not free. On the last day, we tried to make some sandwiches during breakfast for our trip. Mr. Benitez crept up behind us and very rudely told me that "this is not a supermarket", but the restaurant and that I should go to the Supermarket near the hotel to buy food. I was so stunned by such indecent commentary. First of all, we were there on a full board and we DID pay for our food. Second, in any restaurant in the world the food you pay for and don't eat, you can take away. Third, we were also paying for his salary so there were about 50 more decent and polite ways he could have told us that it is not allowed to take away the food. That was the unpleasantness that cast a shadow on our otherwise nice and pleasant time in Calella. The meal times are also oddly set. Breakfast is from 8:00 to 9:45 am, lunch from 1:00 to 2:45 pm (at first) but then changed to 2:30 pm which is very inconvenient since it's only 3 hours from breakfast and the beach is not in front of the hotel. It should have been set from 2:00 pm to 4:00 pm, because dinner starts at 8:00 pm. It looked like the hotel set up those times because of their staff's convenience instead of suiting the guests. It was really apparent during lunch when the restaurant's head waiter was rushing out to leave for an afternoon siesta. Hotel facilities are nice, the beach is close and large. Restaurants and supermarkets are all around. There is a lot of noise during the night because lots of teenagers are visiting this place but it didn't really bother us. All in all such a hotel should take a lot of care on how their staff treats and behaves towards their guests because it is the very foundation of the catering industry. Room tip: Maybe higher floors facing the pool. Stayed with my partner and friends who were participating in Ironman event. Great location, very near to bus stop to Barcelona and the airport, short walk to shops/bars/restaurants. Family friendly. We were booked for bed and breakfast. Hotel had a cashless system for bar or food purchases, the more money you loaded on your acct they gave you an extra top up in cash terms. Beach was a lovely sandy beach , very clean. Small supermarkets near by and a larger one a short walk away. Would return for a short break. The hotel allowed bikes and kit to remain in the bedroom. This hotel was a very pleasant descovery. Very nice employees, good food, good location near to city center. Very clean hotel. Wi-Fi works perfectly. The rooms and the exterior look renovated recently. Stayed one night because of the flight cancellation. The personal was very kind to give information and provide breakfast at 3am. The hotel is clean and with a swimming pool, and well located, with some restaturant nearby and a big supermarket not too far from it.